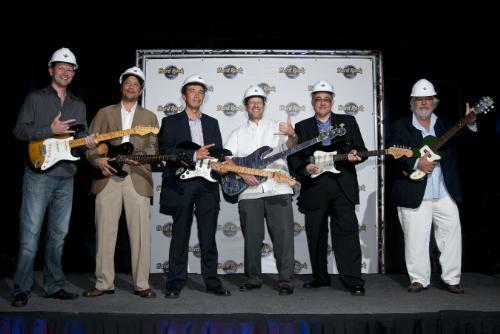 PANAMA CITY, May 25, 2011 /PRNewswire/ — Marking its 16th property, and its first in Latin America, Hard Rock International today announced that the Hard Rock Hotel Panama Megapolis is expected to open in December 2011. The 66-story hotel, located in Panama City just a few miles from one of the Seven Wonders of the Modern World, the Panama Canal, will offer stunning panoramic views of the city and Panama Bay, with its yachts and sailboats. Hard Rock Hotel Panama Megapolis, which brings the acclaimed “Hard Rock Hotel experience” to an ever-popular global tourist destination, is developed and owned by Megapolis Investment Group and will be managed locally by Decameron Hotels & Resorts. Located on Balboa Avenue, and connected by bridgeway to the cross-street Multicentro Mall and the Megapolis Convention Center, currently under construction, Hard Rock Hotel Panama Megapolis is situated on more than three-quarters of an acre, with lush landscaping and an oversized, free-form infinity pool with private cabanas. The hotel will have 1,499 rooms, including 796 suites, ranging in size from 462 square feet to 2,659-sq. ft. Rock Star Suites, a signature of the Hard Rock brand. In addition to the existing Hard Rock Cafe in the attached Multicentro Mall, the hotel will offer eight food & beverage outlets, including an indoor/outdoor bar & club on the 62nd floor – an exclusive place to be seen, and to enjoy a bird’s-eye view of the city and distant mountains – as well as a breakfast, lunch & dinner buffet. For those seeking relaxation, there will be a 7,800-sq. ft. Rock Spa® featuring 14 luxurious treatment rooms, and a Rock Shop® store for guest necessities and souvenirs. The hotel will also offer business travelers and special event patrons 24,250 square feet of flexible meeting space to accommodate gatherings large and small. Throughout the hotel, guests will be able to see and experience an abundance of authentic rock memorabilia and state-of-the-art technology, including Hard Rock Hotel’s popular amenity program The Sound of Your Stay®, which lets guests download complimentary music from distinct curated playlists. The opening of Hard Rock Hotel Panama Megapolis will allow guests to join Hard Rock’s global network of hotels/casinos/cafes and participate in events, both local and global, such as its three-day music festival, “Hard Rock Calling,” in London. Part of Elhayek Group, leaded by Jacobo Torres, with more than 30 years experience in the retail business in the Colon Free Zone, with brands such as Aiwa, Pioneer, LG, Samsung and others. The Group has developed a Real Estate portfolio with many properties in key locations around Panama, the most important being the Multicentro Centro Comercial, the first Shopping Mall of Panama, with more than 200 shops. The Group has investments in the Hotel business, with interests in Hoteles Decameron Panama, owns the Radisson Decapolis Hotel and mayor participation in the new Hard Rock Hotel Panama Megapoolis and the Megapolis Nortia Tower development. The group has also has participation in the Casino business, as co-owner of the Majestic Casino, located in Multicentro. Decameron Group of Hotels & Resorts is comprised of 38 hotels in 10 countries located throughout the Caribbean, Central America, South America and Africa; offering all-inclusive vacations at an affordable price and premium city hotel experiences for corporate and leisure travelers. Established in 1987, the company’s 7500 employees are an integral part of an efficient operation providing unique, high quality vacation experiences at affordable prices. Decameron also includes Decameron Explorer, a tour and ground handling operator; and several other hotel management companies. Decameron Hotels & Resorts has been the recipient of several prestigious awards such as “Excellent Service and Quality” awarded by AirTransat Group Toronto, Canada and “High Standard of Service and Quality” awarded by Air Tours Holidays, United Kingdom. For more information or reservations please visit our website at www.decameron.com. With a total of 163 venues in 50 countries, including 126 cafes and 15 Hotels/Casinos, Hard Rock International is one of the world’s most globally recognized brands. Beginning with an Eric Clapton guitar, Hard Rock owns the world’s greatest collection of music memorabilia, which is displayed at its locations around the globe. Hard Rock is also known for its collectible fashion and music-related merchandise, Hard Rock Live performance venues and an award-winning website. In addition to the two flagship Seminole Hard Rock Hotels and Casinos in Tampa and Hollywood, Fla., Hard Rock Hotels/Casinos are located in Las Vegas, Biloxi, Orlando, Chicago, San Diego, Pattaya, Bali, Macau, Penang, Singapore and Punta Cana [Additional hotel and casino projects have been announced in Panama, scheduled to open in 2012] [and Hungary, Dubai and Abu Dhabi, scheduled to open in 2013. Hard Rock International is owned by Seminole Hard Rock Entertainment, Inc. For further details on Hard Rock Hotels and Casinos, visit www.hardrockhotels.com. For more information on Hard Rock International, visit www.hardrock.com. Gourmet Toothpicks. Yes, Gourmet. Toothpicks.